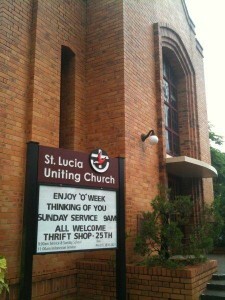 The St Lucia Uniting Church is a small, vibrant and active congregation situated in close proximity to Ironside State School, Indooroopilly High School, St Peters Lutheran College and the University of Queensland. The congregation is in a unique location. Situated in the Bremer Brisbane Presbytery we are responding to the Presbytery’s vision: “Building Healthy Christian Congregations: Living God’s Mission”. At St Lucia Uniting Church we are listening afresh for God’s call on us as a church community. We are following the theme “Living the Faith”. To be picked up by the church bus on Sunday please call Marilyn Healy on 0411 418 599 by Saturday evening.